Finally, after the long wait, I found the job that suits me. Imagine, I can now work in the comforts of my home, in my PJs (!) and anytime of the day as I feel like it. No more worries about traffic, no more pollution and most importantly, no more waking up so early in the morning! I feel like the world is totally on my side as I read the contract sent to me by my "new" employer. But, just when I was about to hit the accept button for this particular job, I heard this sound so irritating and disturbing! tssssssssk! tssssssk! brrrrrrrrrrr! brrrrrrrr! Something like that. You see, it's really hard to put the sound in words! When I was still working in the hospital as a nurse, I really don't care about what day it was. As long as I have a rest day, my life goes on, and on, and on. On weekdays back then, I can sleep all I want in the peacefulness of our home because: a.) I am the only person in the house b.) there's nothing much to do if I stayed up and c.) even the neighborhoods are so silent you can almost hear the earth's heartbeat. Okay, it's exaggerated. You get to escape from all the tortures of your job/school. You can rest your tired mind and body. You are free to do things you can't do during weekdays. The most important of all, you get to spend quality time with your family. However, in my case, it is also only during weekends that my mom cleans EVERY corner of our house. Which btw, includes the carpet I am talking about earlier. Sadly, we don't own a vacuum. That's why she only uses a walis tingting to remove the dirt. The sound it makes echoes around our small house. I am really okay with it since I am already used to hearing that sound even in my sleep. lols. I sometimes even do the cleaning myself. But when I got to know that there is a way not only to get rid of that sound but also to help us clean faster, well, I felt so awesome! It is environment friendly. 55% of the cleaner's body is made-up of recycled materials. 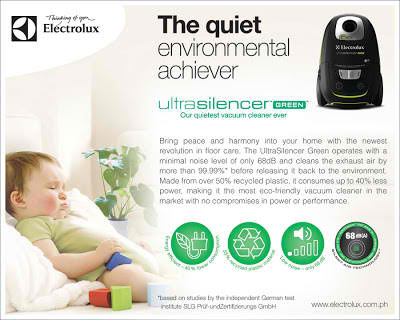 It is FOUR TIMES QUIETER than other vacuums! It is the quietest vacuum ever! Ever! Ever! Energy efficient. It uses 33% less energy! It's not only that! 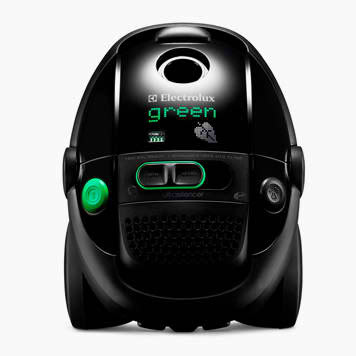 For us, having this vacuum (since we don't own any vacuum at all) could save a lot of time that we can likewise spend bonding, watching movie or just preparing foods and eating. Speaking of preparing foods, when I was younger, during mango seasons, we always prepare mango smoothie using my mom's 5-in-1 blender. 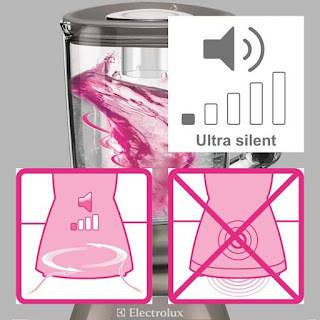 You can never deny that someone is really using the blender because it is soOoo noisy! Over the years, the blender just sat unused inside the cabinet. The only time we use it is when my father crushes dried chilies. The reason? One factor may be the noise the blender creates! 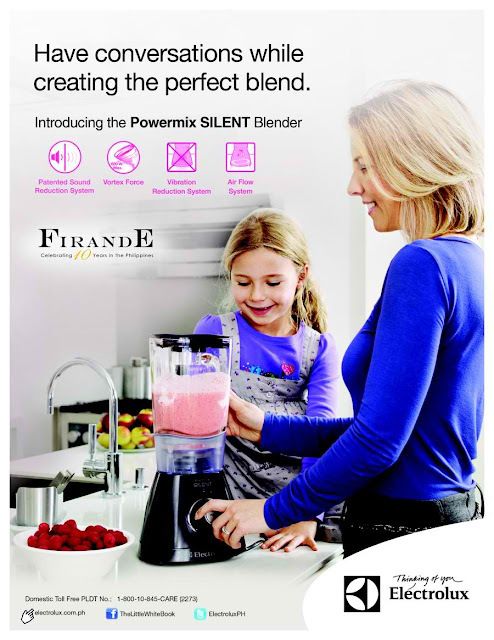 Ten times quieter than the average blenders. If blenders are like this one, preparing your favorite drink can be done anytime of the day without worrying that you might disturb someone. For more information about these awesomeness, visit Electrolux's Site. You may also find them on Twitter. Isa sa kanaiinisan ko ay yung pagwawalis ng kwarto. Parang useless kasi imbes na mawalis lahat ng alikabok ay lumilipad pa sa hanging. After a few hours bagsak uli sa sahig kaya maalikabok uli. Ang magandang panglinis ay vacuum kasi talagang higop lahat ng alikabok.